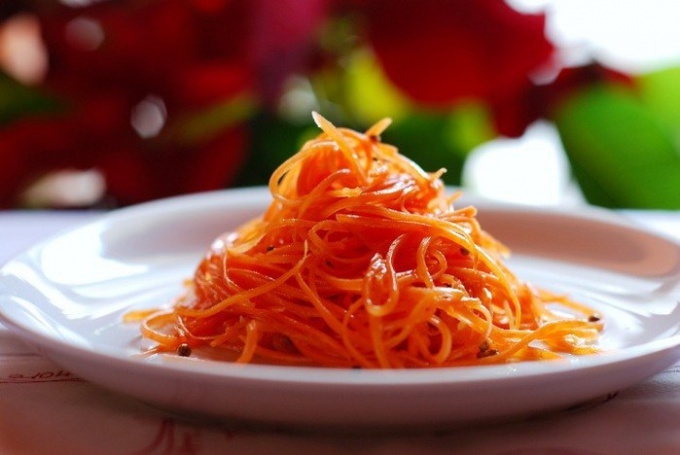 Boiled carrots is not only suitable for children and dietary food. This delicious root vegetable can become the basis for piquant salads. With a delicate sweet carrots are perfectly combined a variety of fruit, sour or spicy vegetables, herbs and fatty dressings. The food it's filling but not too caloric. Carrots peel, cut into strips, put in a saucepan and pour a glass of boiling water mixed with vinegar, sugar and salt. Boil the carrots until tender and drain in a colander. Allow the vegetables to cool and place them in a salad bowl. Slice onions into thin half-rings, add it to the carrots, put in a mixture of green peas. Season the salad with mayonnaise. If you like more spicy dishes, salad can spice up 2-3 cloves of garlic, pounded with salt. Very tasty salad of boiled carrots with spicy lemon dressing. The dish can be served as an appetizer or side dish to meat. Instead of lemon for the filling you can use limes. Peel the carrot and cut it into strips. Put vegetables in a wire basket and lower it into a saucepan with cold water. Cover design the cover and bring the water to a boil. Boil the carrots until soft - it will take 5-7 minutes. Put the vegetables in the dish. In a separate bowl mix chopped ginger and green coriander, add fresh lemon juice, salt and freshly ground pepper. Heat dressing and pour over it a salad. Serve immediately. A great option for a hearty dinner - carrot salad with black olives, tomatoes and cheese. Choose smoked cheese with salad will turn out especially delicious. Peel the carrots and cut in half, pour boiling water and cook until soft. Cool the carrots and cut into their circles. Put carrots in a deep pan with heated olive oil and stir fry for a few minutes. Pour contents of skillet grated smoked cheese and continue mixing. Cheese needs to soften. Tomatoes cut into small pieces and place in a salad bowl. Add the olives and carrots with cheese, stir and pepper and immediately serve. This salad is especially tasty with fresh baguette.